Tulip planting is one of the easiest and most rewarding gardening projects. Tulips range widely in terms of color and size, making them appropriate for many types of gardens and projects. Tulips can be found in a large variety of colors, sizes, and shapes. Each type will have specific climate zone requirements as well as preferences for light and soil conditions. In general, larger, more exotic tulips may only bloom a few years before they must be replaced. Smaller tulips may be ideal for a beginner's tulip planting because they often self propagate and require less care. Many gardeners prefer to choose several different varieties that bloom at slightly different times during the year. This allows gardeners the pleasure of having tulips for over a month, rather than the few weeks that a single species will provide. 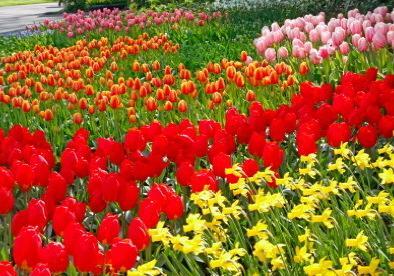 While the requirements for specific species of tulips may vary slightly, most have similar soil and sun requirements. Tulips need well drained soil to prevent rot. If the soil is too dense and does not drain, add compost or peat moss to encourage better drainage. Most tulips thrive in anything between full sun to partial shade. Of course, this will vary between species. Some tulips are popular because they thrive in shady areas where other plants may not, such as at the base of a tree. Unlike many other flowers, tulips are best planted in the fall in most areas of the country. While planting charts can be obtained for each specific climate zone, a good rule of thumb is to plant the bulbs six to eight weeks before a hard frost. For most areas of the country, this is late September through October. If you live in a particularly warm climate, plan on refrigerating the bulbs for at least six weeks before you intend to plant them. This will help cue the bulb that it should remain dormant until spring. Start tulip planting by tilling the soil to a depth of at least fifteen inches. Now is the time to add any enhancements to the soil, such as bone meal. Each bulb should have a recommended planting depth. However, a good rule of thumb for tulip planting is to dig a hole that is three times as deep as the length of the bulb. Always place the bulb with the pointed side facing upwards. Cover the bulbs with soil. They should be spaced about six inches apart, or according to the instructions that came with the bulbs. While you may be tempted to use a grid layout when tulip planting, these flowers look best in relaxed groups. Once your tulips have flowered, there are a few steps that can be taken to encourage their growth through the rest of the season. After the blossoms have died, cut back the stems, but leave the foliage of the plant intact. This will encourage the bulb to regenerate and store nutrients to bloom next spring. Add compost or fertilizer to encourage regrowth next spring. If the tulips appear crowded, consider learning how to lift flower bulbs to maximize their growth potential. Although many gardeners enjoy tulip planting, there are some areas of the country where maintaining tulip beds can be difficult. In this case, consider planting bulbs in containers so that you can enjoy your tulips without fighting the climate and wildlife.